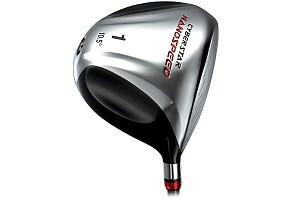 This Cyberstar Nanospeed Driver takes full advantage of the benefits generated from using nanotechnology that assists in a further, straighter ball flight. With a strong, lightweight nano C60 carbon graphite material shaft, your swing speed will be increased on an average of 1m/s. And the 460cc head features a strong, 1mm thick nano C60 carbon graphite crown. By reducing the weight of the crown, it will lower and deepen the COG (Centre of Gravity) resulting in a higher ball trajectory, traveling further distance. With a higher launch angle, decreased spin rate, greater sweet spot and higher MOI (Moment of Inertia), it is guaranteed your performance will be improved every golf game. In conjunction with Golf Pride, Yonex have produced a strong, multi-compound grip designed especially for the Cyberstar Nanospeed Driver that is soft to touch yet maximises your grip and control. The Cyberstar Nanospeed Driver’s C.O.R (Coefficient of Restitution) is compliant with the USGA & R&A Limit of 0.83 so you can use it in any competitions, worldwide. Tuotteen lisäyspäivä: keskiviikkona 28 lokakuuta 2009.